A recent case before the Administrative Appeals Tribunal (AAT) shed light on a growing phenomenon that you should keep in mind for work-related or business expense deduction claims. This case involved a business purchase on Gumtree. The case involved a taxpayer’s attempt to claim for the cost of work-related tools that he bought through the classified ad and community exchange site Gumtree. The online buy-and-sell site has enjoyed increasing use since it launched in 2007 and has seen an expansion of the range of items listed on its pages beyond the proverbial spare bookcase or cheap bicycle. In the case concerned, the taxpayer, an engineer, allegedly bought a set of very expensive aircraft maintenance tools he found on Gumtree for which he paid about $25,000 (apparently a bargain for the sort of tools concerned). The seller provided an “invoice” of sorts, that merely listed his contact details and a description of the tools, which was handwritten on a sheet of paper. Not only this, but the engineer paid cash that he said was made possible by way of gambling winnings, and which he had not deposited in a bank but kept at home. By the time of the AAT hearing the ATO had already looked at the “invoice” and found that the contact details were false. There was also no evidence of the gambling winnings, and also no evidence of the existence of the tools apart from the handwritten description. The engineer said he had since “sold” the tools in a similar manner. Of course, the AAT disallowed the engineer’s claim for the cost of the tools as a tax deduction. The biggest lesson from this case is that you must be able to provide evidence for all business related expense claims! You can expect to face difficulties when buying items that would probably otherwise be claimable when they are bought through peer-to-peer sites such as Gumtree or even through Facebook groups. This case, and the lesson to be learned from it, is not so much about the deductibility of work-related expenses, but rather the need to be able to substantiate such deductions — and what may or may not be accepted by the ATO. What’s more, there is also additional leeway in that the ATO has the discretion to still allow a deduction, if the somewhat stringent conditions listed above are not met, if the nature and quality of evidence available satisfies it that a work expense was incurred and a valid deduction should be allowed. This evidence could include, for example, bank statements, credit card statements, photographs or photocopies of a product or service offered at a particular price. Getting back to the case of the engineer, or at least to the fact that his purchase was made, allegedly, via the peer-to-peer website Gumtree. It’s not hard to imagine that there may be many other instances where a buyer agrees to meet a seller at a neutral location such as the local shopping centre (and it’s not uncommon for this to happen, to maintain privacy and/or security) and, given that the transaction is face-to-face and most likely conducted by cash, for none of the expected documentation (from a tax point of view) to exchange hands. And this is not an unusual situation. In many if not most cases, these sellers could be just private citizens getting rid of clutter around their homes, and they are not running a business of selling these items. Therefore, they will have little interest in drawing up “formal” documents or perhaps even be unwilling to disclose all their personal details to a stranger. Mostly they’ll be focused on the cash in the buyer’s hand. 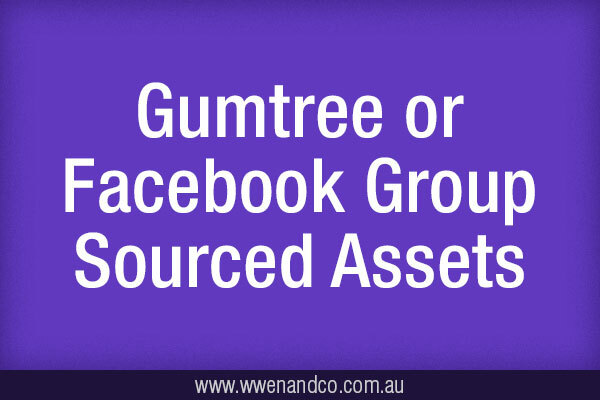 For business transactions (the most likely to seek a deduction for such an expense), a taxpayer with an enterprise, or commencing one, may use one of the several platforms to buy an asset for work purposes — such as Gumtree, Trading Post or a Facebook Buy-Swap-Sell group for their local area. A taxpayer may also use a platform such as Airtasker to engage someone for a one-off business activity, or perhaps even rent some premises through Airbnb for a few days for business purposes. Purchase a second-hand domestic lawnmower to start a gardening business. Purchase a second-hand car in good condition to earn money from driving for Uber. Rent a holiday property to host a weekend yoga retreat. Purchase second-hand furniture to furnish a home office. Of course with these online platforms, there is always the possibility of keeping tabs on the electronic trail. Draw up the document for the vendor and ask them to sign it. Remember that the ATO can accept alternative evidence, so if the seller is unwilling to, say, provide their address, the purchaser and vendor could countersign a document specifying that the transaction took place at a specific location, day and time. If the sale takes place in public, evidence from a related transaction may assist (perhaps a receipt for a coffee or snack bought at the date, time and place of the sale). Photographic evidence of the exchange of goods and money. Withdraw the exact amount involved in the transaction from the bank near the time of the transaction so that there is a record on a bank statement. The ATO will need to see such receipts and other documents to allow for eligible deductions.